This is Alain Resnais’ final film. This is his third adaptation of an Alan Aykbourn play, a different era to his previous exploits within his six-decade canon. Director of art-house classics Hiroshima mon amour and Last Year at Marienbad, Resnais was often ambiguous with his intentions, merging dreams and reality, truth and fiction, throughout his stories. Life of Riley won a Silver Bear at the Berlin Film Festival (only one month before his death) “for a feature that opens new perspectives”, as it does again create conflict between stage and screen. But with a back-catalogue that spans generations, Life of Riley fits interestingly within his breadth of cinematic dominance. Last Year at Marienbad is almost the definition of art-house cinema, with multi-layered sound and scene, toying with memory and truth through the camera lens. Resnais is fully aware of his camera as an artistic medium; his camera is a brush and editing is the cutting of collage. Hiroshima mon amour equally challenges the viewer, with an opening revealing the casualties of an atomic bomb, before drawing our attention to a romantic French-Japan relationship. 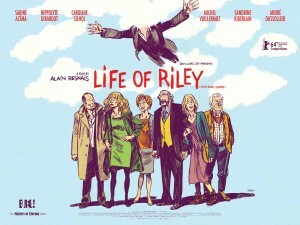 Life of Riley seems flippant in comparison, as the focus is on localised, middle – and upper – class marriages. But there remains a knowing direction that confesses the lie of the cinema screen. These are actors relaying a story. They may, or may not, be real. In George Riley, there is a history we are not aware of and we will not be shown, but it has consequences. It seems fitting that this director has signed off with a film that simultaneously utilises methods and tools he has alluded to before, but within a colourful and almost-comedic context that alludes to a cheeky grin, beneath the darkly-lit, romantically-severe classics he is known for. Life of Riley would not be recommended as the first film to watch by Resnais – the previously mentioned works of art are worth seeking out though. Its staged sets, and animated backgrounds, are a shock initially but they are a refreshing change in pace considering how dominant specific styles of storytelling are. Eric Kohn, of Indiewire, writes how it is a piece of “lightweight … filmed theatre”. And I guess it is. But, as a reviewer who is only swotting up on Alain Resnais’ films in preparation to discuss his last, it feels innovative and interesting – and a type of cinema we don’t see often (and that isn’t a bad thing).